force, they could easily bounce over a 3-story building. Did you know if you hit one just right with a hammer, it exploded? Fabulous. Over our 2 story colonial and into the back yard. Also darn near lethal at the handball courts down at the YMCA. 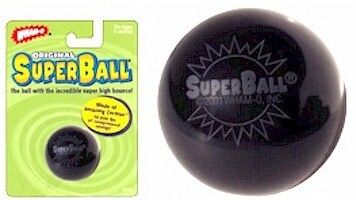 I was in 8th grade when Super Ball first came out and quickly discovered a use for it. If you threw a Super Ball down a school corridor, at an angle so it would hit the floor, lockers, ceiling, lockers and floor again continually down the hall, it would make quite a commotion (WHAT FUN!) and would guarantee some detention time if caught - but it was worth it. Yes, indeed. I bounced one over our single-family house once and never found it again. Also, if you didn't throw it straight down, the ball would reverse its spin on each bounce, resulting in some very weird behavior. For instance, if you threw a Super Ball at the wall so it bounced on the floor first, it would then bounce back and forth from floor to wall, floor to wall. And if you bounced it under a table, it would come back toward you rather than continue out the other side of the table.